In exactly one week, the Obamas will move out of the White House. After eight years, President Barack Obama and his family will move to a new home as his time in office comes to an end. But before it does, the First Family wanted to give the public one last tour of its home—but this time in virtual reality. Felix and Paul Studios, working alongside Facebook's Oculus team and the Obama administration, has spent months shooting an intimate behind-the-scenes tour of the White House to give viewers a more detailed look at what it means to live at 1600 Pennsylvania Ave. The eight-minute version of the film, which debuts today, will be followed sometime next year with a longer 20-minute film. The film, called The People's House, includes commentary from the Obamas for each of the rooms and the connections they share with them while also exploring how the rooms were used by past presidents. In the film, Obama talks about being in the situation room during the raid of Osama bin Laden's compound, but he also recalls President John F. Kennedy's use of it during the Cuban missile crisis. The film—which is available on Oculus VR headsets and Facebook 360-degree video—provides more access to the White House than you would receive if you visited in person for a guided tour. For example, the West Wing isn't necessarily part of the average tour (for obvious reasons). In the VR tour, visitors get to see the Cabinet Room, Situation Room, Oval Office, along with the Roosevelt Room, Vice President Joe Biden's office and more of the executive residence on the second and third floors. For the film, both Obama and First Lady Michelle Obama spent around 15 minutes with the VR production team, where they sat in a room of their choosing and explained what it means to them. In other parts of the film, the Obamas narrate the tour as viewers makes their way through the house occupied by U.S. presidents since the country's earliest days. Over the past eight years, the Obamas have sought to open and enhance access to the White House to visitors. While paying tribute to Michelle Obama during his farewell address this week, the president said she "made the White House a place that belongs to everybody." 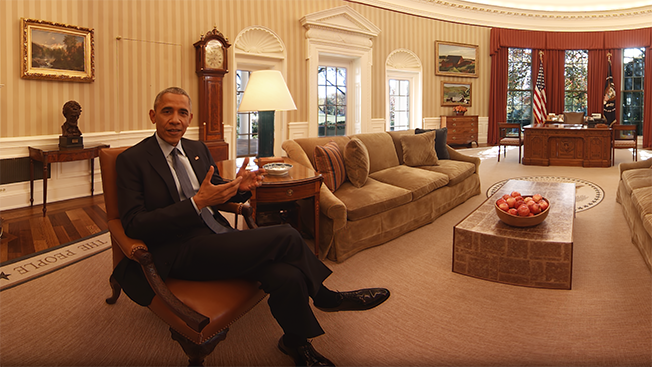 The tour of the White House is actually Obama's second VR film produced by Felix and Paul. Last year, to coincide with the centennial of the National Parks Service, they released a film of the president taking a tour of Yosemite National Park. According to filmmaker Félix Lajeunesse, the co-founder of Felix and Paul, the film fits into the long tradition of presidents using technology to connect with the public. He mentioned the Diplomatic Room, where President Franklin D. Roosevelt used to broadcast dozens of "fireside chats" over the radio. Lajeunesse mentioned Obama's use of VR is part of Obama's trend to embrace new technologies like social media, YouTube and podcasts. "It kind of feels like a natural progression of that to engage with virtual reality and try to make people feel what it's like to live in the White House," Lajeunesse said. "It's very transparent, very genuine. I think it fits with his personality and everything that he's done before." After filming at the White House on and off over the course of a few months, it sometimes felt like being in a museum, Lajeunesse said. At other times, the White House seemed more like an office or home. "When you spend a lot of time there, you realize the White House is a historical institution, where a lot of history has unfolded, but it's also a working place," he said. "There are a lot of people working there and a lot of things going on of course. And it's also a house and a private space. So it compiles all of those different layers of functionality and meaning, and when you spend a lot of time there you start to get a taste of the different meanings."